Bridge Mountain is one of the more impressive peaks in southern Nevada’s Red Rocks National Conservation Area. It gets its name from a large sandstone arch not too far from the summit. Climbers generally cross over this arch on the way up, one of many obstacle-course like features to deal with along the way. After flying to Las Vegas from Boise in the morning, I made the drive to Lovell Canyon, and was then able to maneuver my rental car a mile or so up the jeep trail toward Red Rock Summit. I thought maybe I was pushing my luck with the rental car, and decided to pull over and start hiking at around noon. The first couple miles of hiking were on a rough jeep trail, not passable by passenger vehicles. Along the way I passed a local jeep club making their way up in rock crawlers. I made good time hiking, and made it to Red Rock Summit soon enough. (There is another road that comes up from the other side). This is where the trail begins. From here, I continued at a fast pace through the desert shrub forest, arriving where the trail crests the ridge in about an hour. Here I applied the Dan/Zach rule of climbing the lesser peak first, and made the quick jaunt over the “Crest Peak” (aka New Peak). I paused on the summit of Crest Peak to eat a PB&J and take in the view of Bridge Mountain below. I’d read about the route, and did my best to visualized where it went. But it wasn’t obvious. After lunch break, I retraced by path back to the main trail, and then continued on along the ridge to the south, before hanging a left, and dropping east downhill toward Bridge Mountain. The terrain changed abruptly as I left the shrub forest behind, and began hiking on the red sandstone slabs that would be the norm for the rest of the hike. The trail petered out, but there were occasional cairns to help me stay on route. But I did have to backtrack a couple times to get back on the right path. Fortunately it is open terrain so navigation isn’t too bad. There were a couple steep notches to descend before reaching the low-point on the ridge and some great views into Pine Creek Canyon to the south. After two and a half hours of hiking, it was finally time for the scramble section. 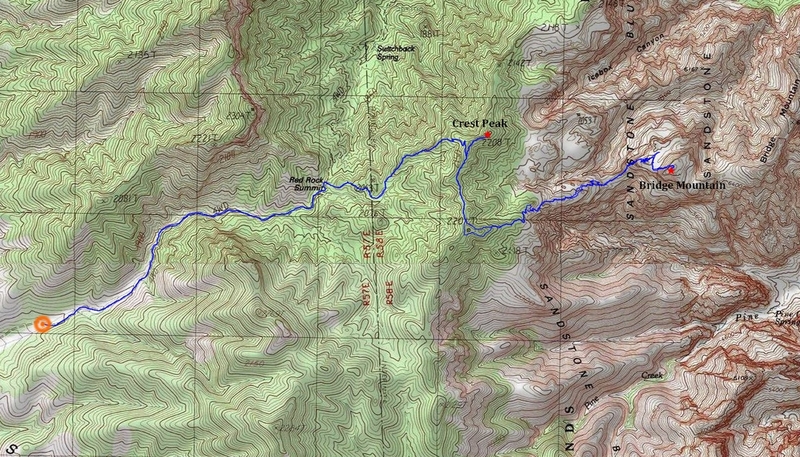 The route initially follows a steep crack, and then a more knobby section before reaching the namesake arch. I traversed to the right, and then up and over the arch, which was very cool. Next is a ledge system on the south side of the ridge that is north of the arch. There is flatter ground for a while after that, as I hiked around the right side of the famous “hidden forest”. The final summit block still presents some challenges. There were occasional cairns that led me up some ledges that took me north of the summit to the summit ridge. The ridge was easy, other than the stiff wind that was making it hard to stay upright. (I estimate gusts up to 50 mph.) After signing the register, I hunkered down behind some rocks for a snack. Soon enough it was time to begin my descent. I made a little better time on the way back down, but there was still some route-finding to deal with. (Those sandstone ledges all look alike!) I did stop and check things out in the bowl behind the arch, and there as even a large ponderosa growing out of the sandstone. Next was the downclimb of the large crack system, which I thought was harder than the climb up. Once back down to the saddle, I still had to climb about 800’ back up to the ridge. I was certainly tired at this point, and all the sandstone was taking its toll on my feet and knees. But I was fueled by the excitement of the day, and kept plodding my way up until I was back on the trail. I was glad to finally reach the ridge crest again, where it would be all downhill from there. I made it back to the car after a round trip of 6 hours, 11 miles, and 3500’ cumulative elevation gain. Map of the route, just under 11 miles and 3500' elevation gain round trip. The road went from bad to worse no long after I parked. Here is the trailhead at Red Rock Summit after a couple miles of jeep road hiking. Typical terrain on the trail headed up to the ridge. View of Crest Peak to the northeast. Me on the summit of Crest Peak, with Bridge Mountain and Las Vegas in the background. Looking ahead to Bridge, now obvious weakness from this perspective. Zoomed in shot of climbers descending Bridge Mountain. The impressive Pine Creek Canyon below. This crack is the crux. Follow the spray paint. First good view of the namesake bridge. View from above after crossing the bridge. Looking back on the route with Crest Peak in the upper right. This sloping ledge leads to the summit ridge. Me on the windy summit of Bridge Mountain, with Las Vegas in the background. Exploring around the arch on the way back down. Looking back on the route up Bridge Mountain.